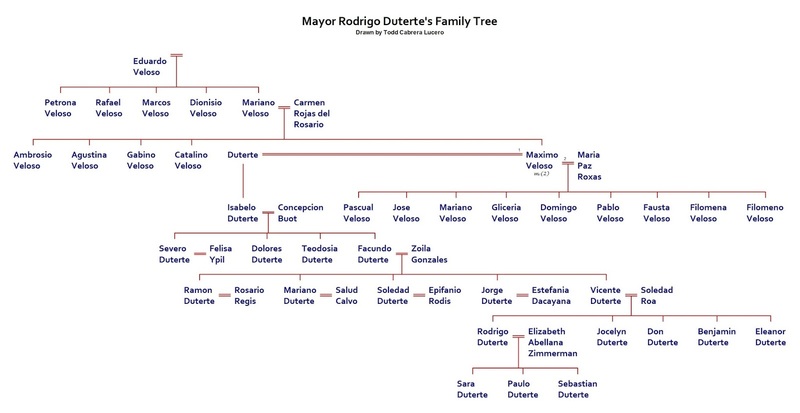 With Mayor Rodrigo "Digong" Roa Duterte finally saying "yes" to a presidential bid and making the upcoming presidential race more interesting, it is high time to begin profiling the presidential candidates through their family histories. In a country where family is extremely important and influential, knowing the family of a candidate will help voters know the candidates better. Like most non-Muslim or non-Lumad families living in Mindanao, the Duterte family traces its roots outside of the land of promise. 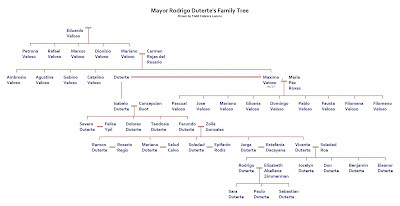 Though the Duterte name today is almost always synonymous to Davao City, the family of Mayor Rodrigo Duterte only came to Davao in 1951 when his parents, Atty. Vicente "Nene" Duterte and Soledad Roa, transferred to Davao. In a previous article it was already discussed that there were already other pioneering families in Davao City. But due to the Duterte family's years of exemplary public service, first in the now divided Davao province and later in the city of Davao, the Duetertes have become just as much a beloved pioneering family of Davao City. Had fate dictated otherwise, Mayor Rodrigo Duterte would have been born Rodrigo Veloso on March 28, 1945. A female ancestor of Mayor Digong, a Duterte from Cebu, had a liaison with a member of the prominent Veloso family. 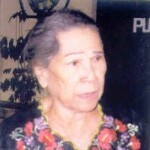 Though some records say that this female Duterte eventually married Maximo Veloso, and indeed their son Isabelo invariably used Veloso and Duterte as his last names, the fact that legal records show that Isabelo's sons, Facundo and Severo, carried Duterte all their lives proves that Maximo never married his Duterte partner, thus ensuring the perpetuation of the last name at least through Isabelo's sons. 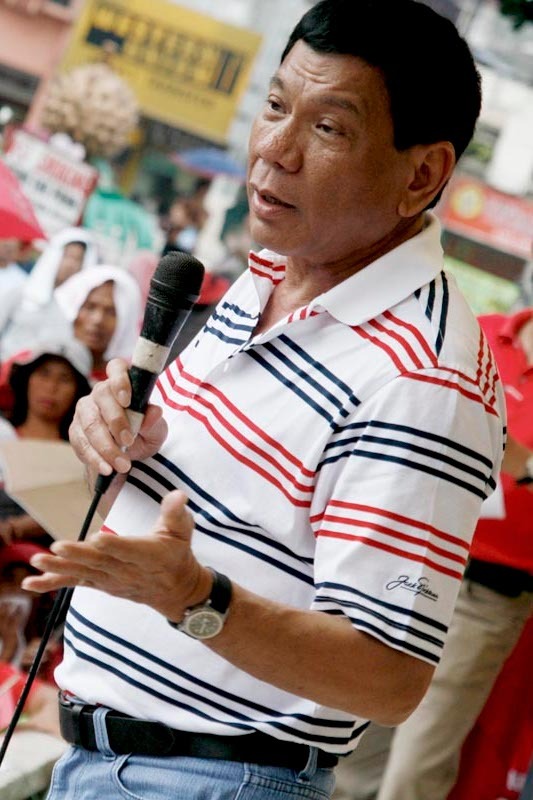 The surname DUTERTE appears to be a Hispanic version of the French term du tertre, which signifies one as coming "from a hillock" or "of rising ground". It is interesting to note that there are many possible metaphors and symbolism one may get from this definition. The surname appears to be most populous in Polanco, Zamboanga del Norte, although older archival records show a huge concentration of Dutertes in Cebu province particularly in Danao City. In Cebu, aside from Danao, it is also found in Carcar City, San Remigio, Carmen, and Ginatilan. It is also found in Sogod, Cabailan, Liloan, and Macrohon, Southern Leyte. Historically it has appeared in Dipolog and Polanco, Zamboanga del Norte, as early as the 1800s. The surname appears in the Catalogo Alfabetico de Apellidos, found 13th from the top of the 4th column of page 42. If we are to believe in legends, the paternal family of Mayor Duterte has a rather interesting and long history. That is because the Veloso clan of Cebu believes its roots are from a 17th century Portuguese explorer named Diego (Diogo) Veloso. This Portuguese explorer was active in Laos and Cambodia, and while history records that he went to the Philippines for some time it is not clear how long he stayed there. What is clear is that his feats in Cambodia and Laos are the ones well recorded by history. The Veloso clan believes that Diego, who supposedly established a profitable business in China and the Philippines in the mid 1700's, was the great-great-grandfather of Don Eduardo Veloso of Cebu, the father of Don Mariano, Doña Petrona, Fr. Rafael, Fr. Marcos and Don Dionisio from whom the Velosos of Visayas and Mindanao originate. Despite the lofty ancestry of the Veloso clan, Rodrigo Duterte's family (in fact many Dutertes) have not been well acquainted with their Veloso connection until recent years. Most Dutertes from Cebu and Mindanao know of their origin from Facundo and Isabelo, but not anything farther. Legends and tall tales aside, Rodrigo Duterte's family started with an Eduardo Veloso, whose son, Mariano, married Carmen Rojas del Rosario. It was their son, Maximo, who founded the current Duterte line. He married Maria Paz Roxas with whom he had two sons. As already indicated above, he had another partner, a nameless Duterte most likely from Parian, Cebu. The Parian Dutertes appear to descend from a Bernardo Duterte and Dominga Guzmán, who both were living in Cebu in the late 1700s. So from this it is clear that the Duterte surname is an old, pre-Claveria decree fanmily name. From this union came Isabelo Duterte y Veloso, who married Concepcion (also Damasa) Buot. Their two sons, Facundo and Severo, are considered the progenitors of Dutertes coming from Danao City. It is believed by the family that the Dutertes lived in Cebu City before transferring to Danao when Severo "Biro" Duterte married a woman from Danao, Felisa Ypil. Facundo himself married another Danao lady by the name of Zoila Gonzales. Facundo and Zoila were the grandparents of Rodrigo Duterte. Despite these connections, Mayor Duterte and his family have never used their connections to elevate themselves. In fact, true to the mark of a true man for himself, Mayor Digong’s father Vicente left Cebu to find his own niche in Davao. Although he practiced law the first year he arrived in Davao, he joined the political arena of Davao the second year he was there, culminating with his election as Governor in 1959. Mayor Digong's mother, Soledad Roa-Duterte, was a public school teacher until 1952 when she retired to assist her husband in his political endeavor. In her Ramon Aboitiz Foundation, Inc. (RAFI) award write-up, she was described as "being familiar with the social and economic problems of the people, especially the out-of-school youth, women, children and the disabled". Even after her husband's death, she continued her involvement in social and civic activities. She faced all the demanding tasks – be it in the community or at home. She proved to all that one can serve the community efficiently and faithfully without necessarily occupying an elective public office. Without a doubt, his parents' exemplary lives influenced Mayor Duterte's style of service to the people of Davao City. He most especially was obviously influenced by his mother's concern for the disadvantaged and powerless. And while many outside Davao City finds his style of governance disconcerting to downright repugnant, majority of Dabawenyos go to sleep at night knowing their properties and life are safe and sound. This is precisely the interesting thing about Mayor Digong: his political pedigree can boast of generations of wealth and public service but his father looked for another place outside of their comfortable sphere of influence in Cebu to start his own destiny - and that of his own family's. Even Mayor Digong shuns the outwardly flashy lifestyle that his own ancestors and relatives display and instead lives in a simple housing unit. His own former wife, Elizabeth Abellana Zimmerman, has described him as "despite being a womanizer, he also listens to activist women and even set up a program that mainstreams “gender and development” issues which resulted to Davao City winning the Galing Pook award for “gender-responsive” governance in 2004". And whatever his detractors say about him, Mayor Duterte is quick to point out that this is who he is. Never before has the Philippines seen a more honest, in-your-face type of presidential candidate. Hi Ivan. My grandmother's roots are from Romblon, Romblon. Would you happen to have information about the Morada-Uy clans? Also the Motin, Millares and Mazo clans. I have been trying to trace these branches of my family tree. Thank you. Please let me know how I can contact you. P.S. I did not make the last revisions as of this time. It was the curator's edit. Also, I was also able to see her birth record before images became inaccessible to non-LDS accounts. Thank you for this information. This is very insightful and can definitely shed more light to our new president's genealogy. Well I have both Roa and Duterte ancestors as well. For more info, check out www.canonigofamily.com! The Roa's and Canonigo married into the Duterte clan what I have are them marrying under lola Venancia Duterte's descendants. JP are you a descendant of Dalmacio Ramas Canonigo? Hi Ivan, I added you on Facebook. I am not that familiar with Google+ and how to use it. 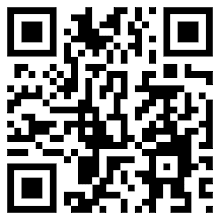 Hope to get in touch with you. How is he (mayor Rody Duterte) related to former Cebu City mayor Ronald Duterte? They are cousins. Mayor Rody's father, Gov. Vicente, was the younger brother of Mayor Ronald's father, mayor Ramon. If you could give some of the years we might probably get those names right. My mother is Ronald Duterte's distant relative I just couldn't figure out which branch under Leon Duterte they are from. She died a few years back and I lost the copy of the family tree that has Ronald's and Digong's ancestors. Hey, I hope you could add some info re: Digong's maternal side. I got this text from a post made by a certain 'Delmar Topinio Taclibon' on FB. President Rodrigo “Digong” R. Duterte’s parents were Cebuano lawyer Vicente G. Duterte and Soledad Roa, a native of Cabadbaran, Agusan, who was a school teacher and a civic leader of Maranao descent thus, Ka Digong possess Moro bloodline. While he is a devout Catholic and his father, former Governor Vicente Duterte, was a true-blue Cebuano, his mother, the late Soledad Roa Duterte, had both Maranao and Kamayo blood in her. The Maranaos are among the tribes in the Southern Philippines living in the periphery or vicinity of Lake Lanao who embraced Islam while the Camayos are the tribal people of Surigao and Agusan. The Kamayo People are concentrated in Bislig City, Lianga, Marihatag, and San Agustin in Surigao del Sur, Mindanao. A scattered population is also found in Cateel and Baganga, Davao Oriental. Kamayo is related linguistically to the Tausug and Butuanon, and belongs to the Meso and central Philippine family of languages. The Duterte matriarch was born in Cabadbaran, Agusan del Norte to a family which had Chinese, Maranao and Camayo lineage. Duterte’s first-born son, Paulo, also married a Tausug-Maranao girl and his children have embraced Islam so that Ka Digong has Muslim grandchildren. The Roas are descendants of Rajah Samporna, an 18th century warrior nobleman from the Sultanate of Baloi and Tagoloan, who married a Spanish noblewoman. The Roa family took refuge in Dansalan (now Marawi City) under the care of Sultan Alauya Alonto during the Japanese war. Samporna's lineage can be traced to the bloodline of Moriatao a Bai in Uato (Balindong) and Maruhom Baraguir of Maguindanao and Mala Bayabao (Ditsaan Ramain). The Pelaezes, Neris, Cabilis, Chavezes, Emanos, etc. are descendants of Rajah Samporna as well. Sharif Kabungsuan, grandson of Sultan Zein ul Abedin of Malaysia (Johor) is the ancestor of Rajah Samporna. Sharif Kabungsuan is the great, great grandson of Fatma Zohra (Fatimid Dynasty), daughter of the Prophet Mohammed, according to Malaysian genealogy experts. 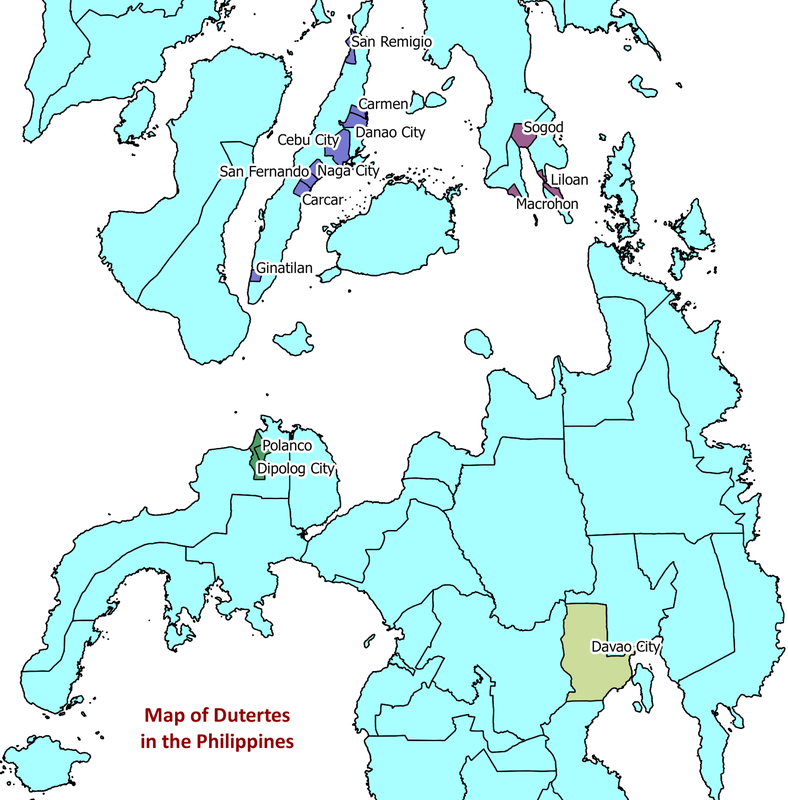 All Sultans of Mindanao (Maguindanao (3), Sulu (1) and Pata Pongampong a Ranao (4), Malaysia and Brunei must descend from that bloodline, as a rule. Research: Datuk Delmar Nur Faramarz Ferdowsi Salah Ad-Din Topinio Taclibon, Bt., DKR, KRSS, MBA, Phd.D.A. Now, I am truly happy that my former neighbor in Central Park Subd., my table tennis trainee Paolo is also my 4th degree cousin. Thanks google for the info. Hi! I know this post is old, but I was wondering if you have the Roa family clan info?